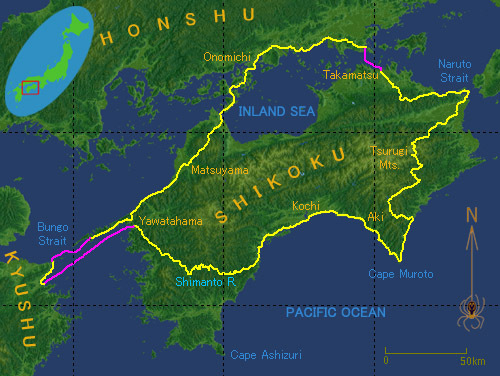 A map of our Shikoku cycling trip. The cycle route is shown in yellow and ferry sections are in magenta. We cycled some 1100km in 12 days. After a heady descent from the mountains, we suddenly find ourselves on the wide but nearly empty coastal highway heading to Cape Muroto, a pointed promontory that defines the south-east coast of the island. 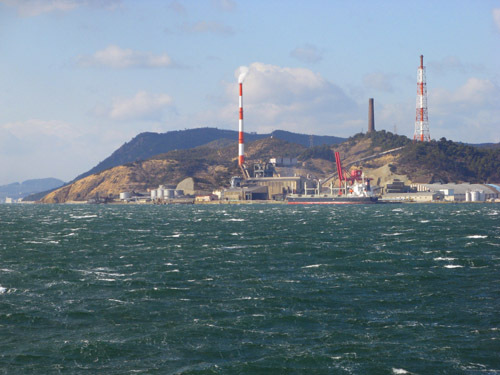 The warm Kuroshio Current impinges on Muroto like no other part of the Japanese mainland, influencing the local climate. It is significantly warmer than the inland areas, and subtropical vegetation such as palms abound on this coastline. As we did in the mountains, we have some trouble finding nourishment along this surprisingly barren stretch of road. It's mid-afternoon by the time we dig into our first meal of the day. Overlooking the numerous tourist traps scattered around Muroto, we take a stroll in the rock gardens along the apex of the legendary cape. 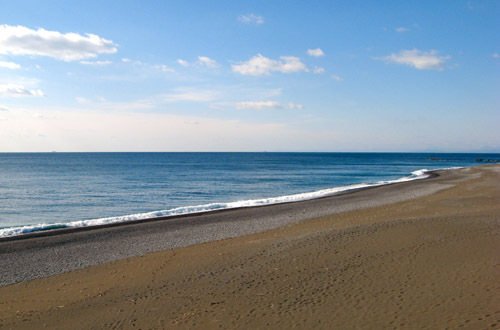 It is one of the stormiest and windiest places in Japan, but today the sea is calm as a mirror and there is almost no wind. 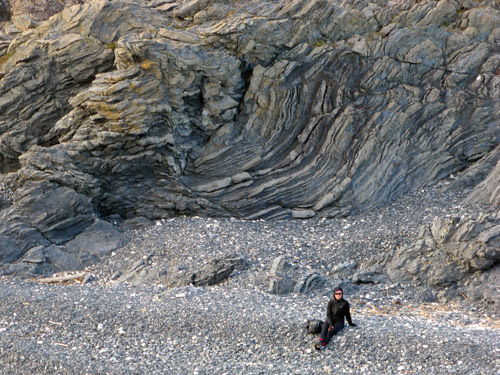 Only the wave-swept gravel and pointed rocks scubbed bare by the ocean bear witness to the usual conditions. Muroto is a turning point of sorts on our journey: from here we head more or less back west, shrinking the distance to our destination point daily. 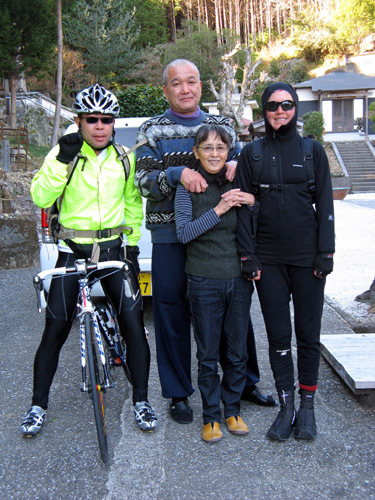 In the small city of Aki along the way, we meet Mr. Ito, his family and friends. He is a Buddhist priest. Leanne teaches English at a kindergarten in Amakusa that is adjunct to a temple, where she must be in the head priest's good books, because he gave her contact information for this disciple of his in Shikoku. We only intended to stop for tea, but upon a cordial invitation to stay, we decide to spend the night. We spend the afternoon and evening talking to Mr. Ito and his wife, who are first-rate hosts and warm, kind human beings. Then Mr. Ito takes us out for delicious Italian dinner, inviting two other interesting friends, including Hama-san (here on left), an erstwhile policeman and cyclist. He accompanied us half-way on our way the following day, glad for a reason to take his fancy road bike for a spin. A cold but pleasant sunny day awaited us as we made our way along the great arc of Pacific beach on the Kochi coast in the south of Shikoku. 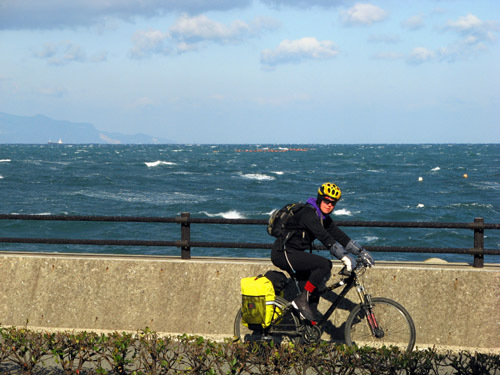 The ocean stretched to the horizon on our left, framed by the distant Capes Muroto and Ashizuri; this grand scenery remained ever static, giving the illusion of cycling on a treadmill. Traditional boats dotted the beach here and there, giving some perspective to the vast landscape. 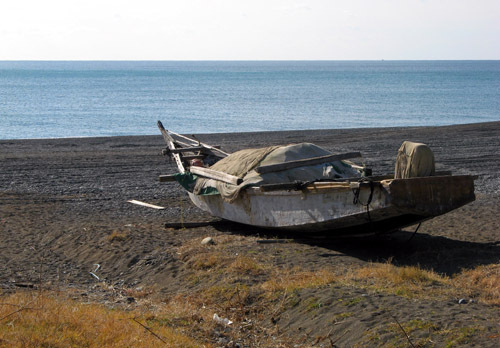 The absence of ports for long stretches here meant that fishing boats had to be designed to be beached when not in use. Taking advantage of the sea's warmth, we camped at the point where we would turn inland. The next morning's cold air created mirages as it met the warm sea among the rocks and islands of the coast. 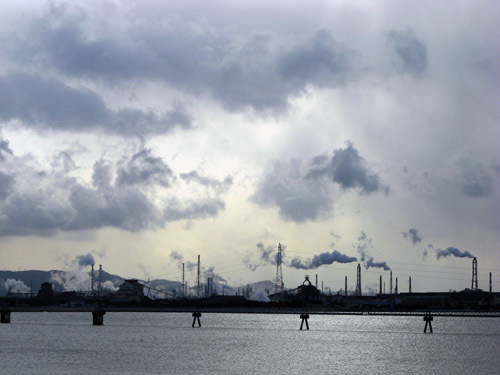 We were unprepared for the dramatic transition to inland climate. Atop a 300 meter hill, we took a break in the sunshine still facing the ocean, enjoying what was probably the warmest outdoor moment of the whole tour. Then crossing a short tunnel to the plateau on the other side, we suddenly felt like we entered Siberia. A cold, biting wind hindered our progress and the water standing on the rice paddies became a sheet of ice. 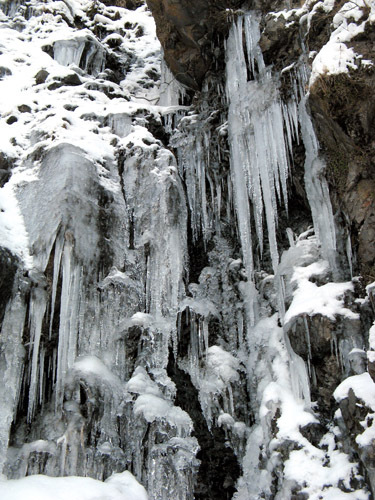 The wind and cold continued as we entered the valley of the scenic Shimanto River, where icicles hung from the ubiquitous water wheels at roadside tourist traps. 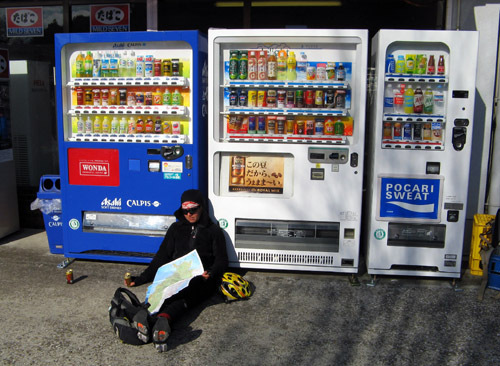 Resting at a bank of jidohanbaiki, Leanne comforts herself with a can of hot drink while she checks the map wondering how much more headwind we'll have to endure. Even as we struggled on we were not oblivious to the quaint scenery of the Shimanto. 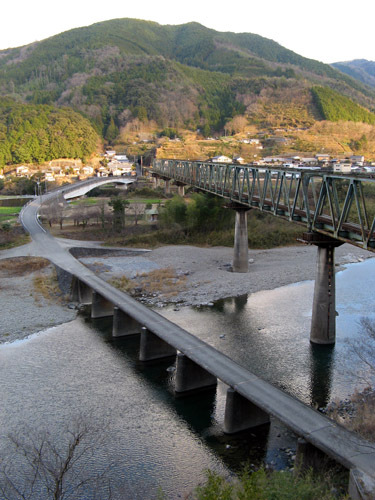 This clear-running river is well known as one of the only un-dammed and generally undisturbed rivers in the country, so much so that it may be the only attraction in Shikoku Japanese know about. Here, Leanne crosses a typical one-lane, guardrail-less bridge across the pristine-looking water. Here's another view of one of these bridges. A railroad also snakes along the river valley. 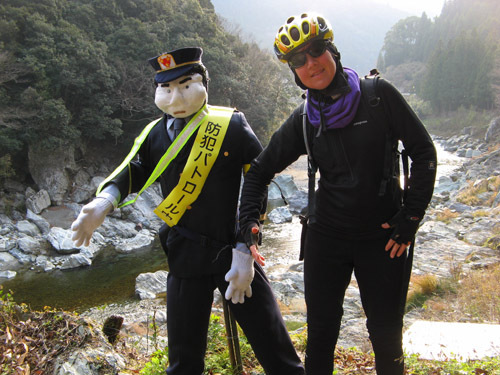 Rail tours of the Shimanto are undoubtedly popular in season with Japan's multitude of train enthusiasts. The end of a long day brought us to the town of Ekawasaki on the lower stretches on the river, where we soaked our tired bodies in a hot spring and even enjoyed a coin operated massage chair. These facilities were built for tourists, but winter is off season and we had them to ourselves. Similarly, we installed our tent on a comfortable wooden deck at the riverside campground, free of charge as usual. 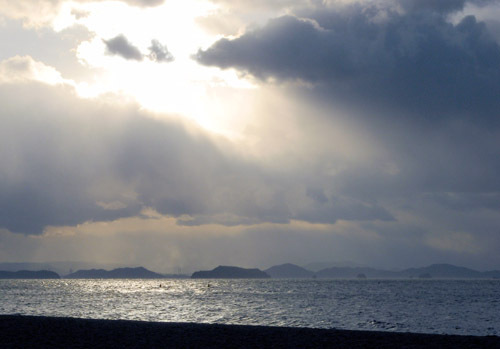 The weather, which had held wonderfully until now, began to destabilize somewhat, so from the Shimanto we made a one day run back to our car. 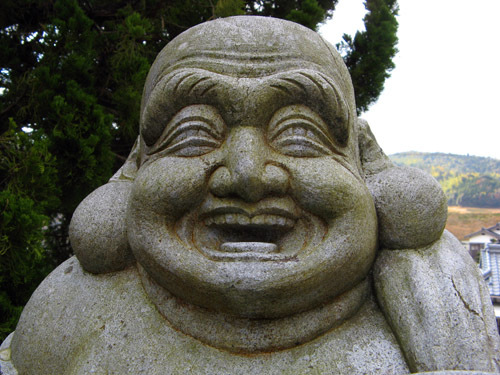 We were once more on the track of the o-henro; this happy Buddha sits at one of the pilgrimage temples on the way. Beyond a final mountain pass awaited us, and then we descended once more to the ocean. 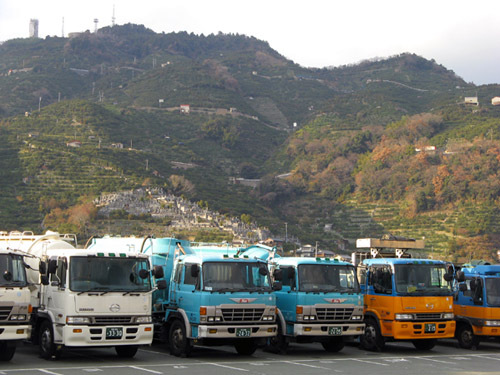 Construction machinery and hillsides covered with mandarin orange groves dominate the scenery at the port town of Yawatahama, from where the ferry would take us to Kyushu and our parked car. On the ferry and the drive home, we reflected on this trip. It has taken us through many landscapes, some beautiful, some dreary, and we had to patiently endure the cold, day after day. 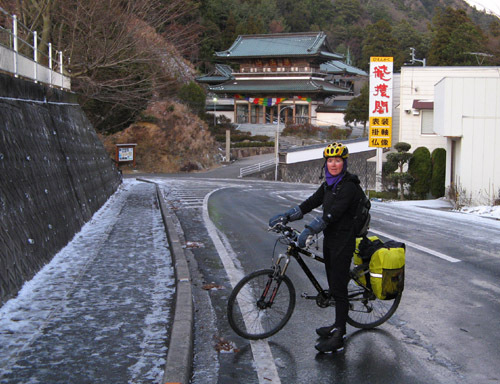 Perhaps the trip's greatest value was its subtle meditative quality; the endurance required strenghtening our spirirs, and reawakening in us an appreciation of the beauty of southwest Japan during its relatively mild but persistent winter season. Morning of Day 3: Hiroshima Prefecture. 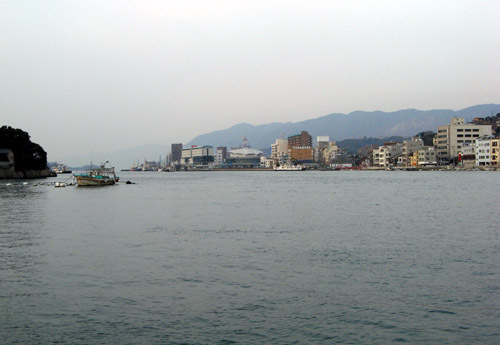 The skyline of Onomichi on the Honshu side of the Shimanami Highway -- typical of a small Japanese city. 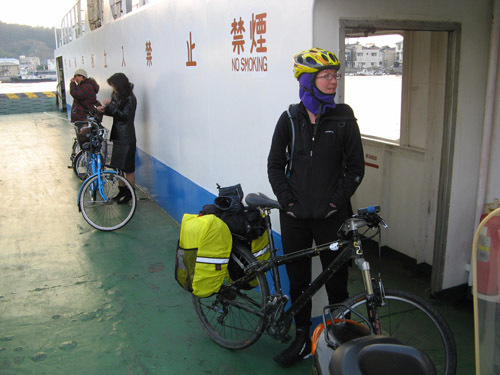 The bridge over the final, narrow strait to Honshu cannot be traversed by bicycle, so we took a short ride on a small ferry along with some local, more practical cyclists. Close up, Onomichi turns out to be a pleasant town: lively fish markets bustle with local people shopping for their day's sustenance. We find virtually authentic French patisserie where we can't but stuff ourselves with delicious croissant sandwiches that power our journey for the rest of the morning. Seemingly endless stretches of trashy suburbs and industrial parks await us down the length of the Honshu coast as we leave Hiroshima Prefecture for Okayama. 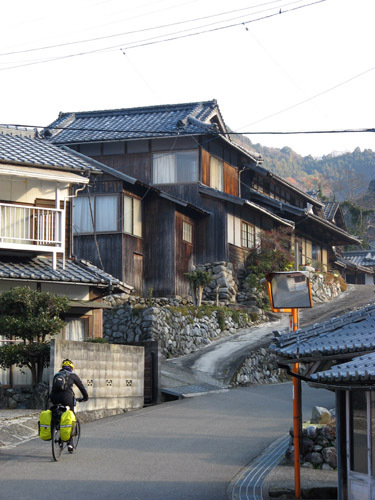 Cities with names such as Fukuyama and Kurashiki, though somewhat larger than Onomichi, seem drab and lifeless. We push on, straining to find some beauty somewhere. 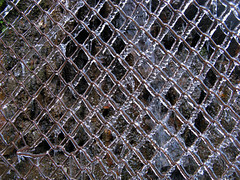 Perhaps in the starkness of the cold silvery light streaming down from the cold winter sky. By mid afternoon, showers come down, and bad weather threatens; we take shelter in a large concrete gazebo on a roadside beach. As we pace about trying to stay warm and pass time, the radio weather forecast announces a cold snap due the next day. Now, at least in West Japan you have to take this with a grain of salt - by the way the locals react to the slightest chill, one might assume their ancestors come straight from Tahiti. Nevertheless, we are somewhat apprehensive. Indeed, the next day dawns with low, racing clouds and freezing temps. A northwest gale blows most of the day and the next; thankfully it is at our backs as we make our way ever eastward. The breeze does its best to rough up the landlocked Inland Sea, affording us a chance to snap a couple interesting pictures from the ferry to Takamatsu City. Back to Shikoku again! We are glad to be finally escaping the crowded, trashy cities and heading into the hills, but the landscape freezes as soon as we gain any altitude. 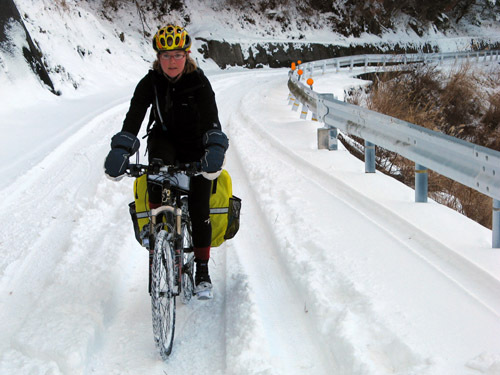 Black ice completely coats the road at Obonji, the 88th and last along the famous temple pilgrimage trail around Shikoku. Coldest of all is the way back down; some sections are accomplished with one foot firmly braced against the ground, sliding down with the bike in a more or less stable triangular configuration. 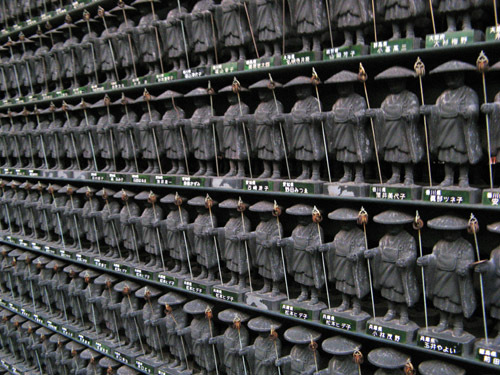 We're not sure, but these figurines at Obonji perhaps commemorate those who successfully finished the full pilgrimage. Real pilgrims in more or less the same getup were a common sight where our tour happened to coincide with the o-henro or pilgrimage route. O'Henrys, we began to call them, telling something of our own mental state as well. Early-retirees, midlife crisis 'salarymen', young men at odds with the cog-in-the-machine arrangement that is Japan, on a wander in search of some meaning in the unfathomable emptiness that stretches just beyond the thin skin of tangible reality. Where the mountain and sea meet they crowd out the cities. 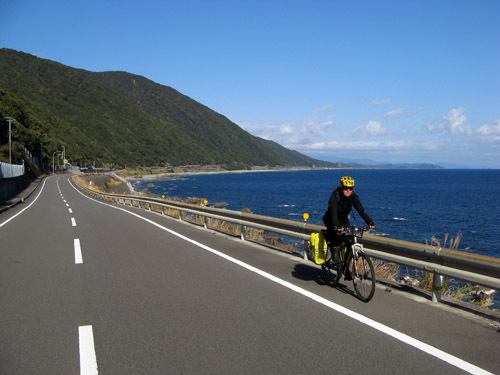 As one nears the Naruto at the east end of Shikoku, there is only enough space for a two lane road between the salt waters and the hills. Come to think of it, we could be equally (un)comfortable in our kayaks traveling on the other side of the coastline. 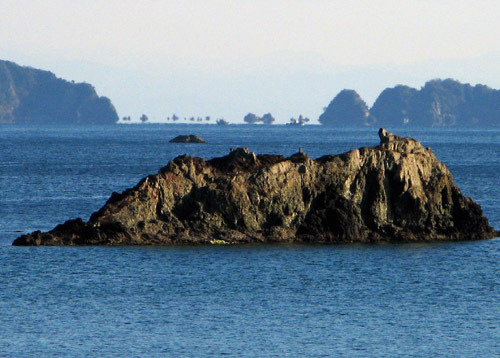 The Naruto Strait is one of the few places we specifically planned to see on this tour. 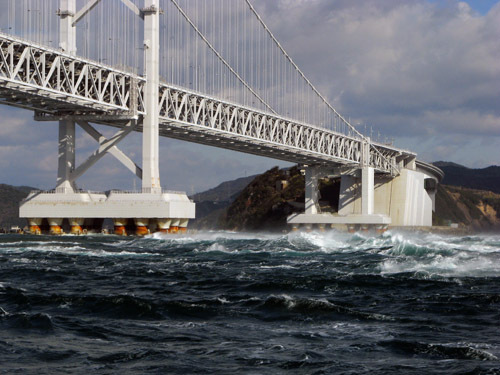 A drastically narrow pass links the Inland Sea to the Pacific Ocean, leading to the most violent tidal currents in all of Japan. With anticipation we board a tour boat and minutes later come face-to-face with roaring rip currents the likes of which we'd never seen. In conjunction with the windy weather, the ship is so awash in spray it is hard to take any pictures! (Still, I think I could take these waves on in a kayak.) Anyway, we were lucky: as our ship comes back, the captain cancels the rest of the afternoon tours, citing rough weather. Another view of the strait, with freighter for scale. 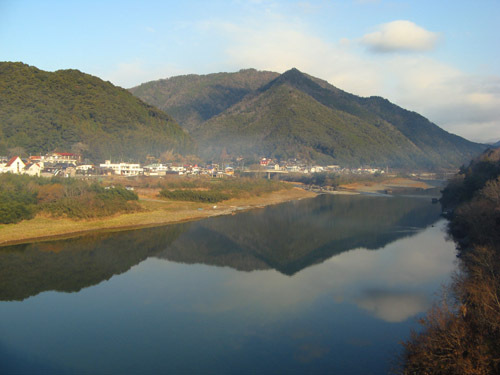 After Naruto, it is time for the Tsurugi Mountains, an extensive and remote area that fills much of the inland of eastern Shikoku. 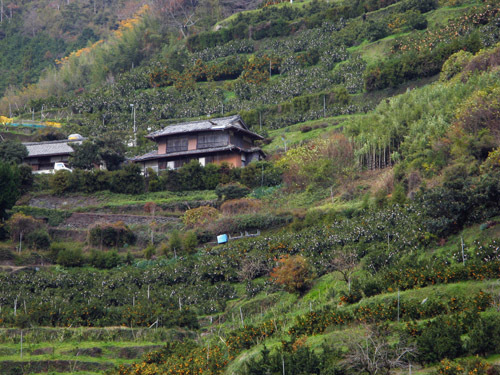 As soon as we leave the lowland cities behind, we are exposed to the poignant culture of the inaka (boondocks). Notable are lifesize figures recalling common sights of country life, such as this traffic officer. Thousands such volunteers help elementary school students get to school safely every day in Japan. Community service minded Leanne takes some pointers. If you like these dolls, check out Leanne`s blog for more. Climbing toward 1060m Dosu Pass, we finally gain height in a serious way and enter the snowy, frozen scapes of the inner Tsurugi Mountains. 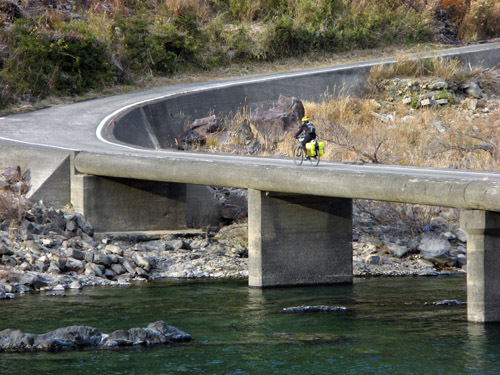 Although many are national highways, the twisty roads that barely manage to cut through this difficult topography present no shortcuts from anywhere to anywhere. Suddenly we are down to meeting only two or three cars per day, surrounded instead by a heavenly, natural quiet. It's a stark contrast to the unsightly, noisy cities on the plains. And still, equally desolate. So why do we feel so much more comfortable here? The cold and the snow are still much preferrable to diesel fumes and constant sight of run-down plastic siding. Drifting south, we stay high and leave the snows behind. Clearly the northern ridges we left behind caught most of the storm's precipitation. Now approaching the Pacific Ocean with its warm currents, the vegetation too seems to change to include more evergreens like the ones we are used to in our home islands of Amakusa. But this is a more remote place, with only logging roads, the odd dam, and nary a vending machine or shop in sight. 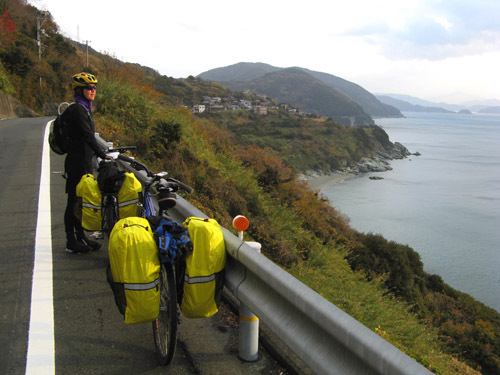 Over our winter holidays, we spent two weeks more or less circumnavigating Shikoku, the smallest of the four large Japanese islands, by bicycle. Usually, we like to restrict our rambles to uninhabited, usually mountainous regions, especially in this country where the populated areas are truly not very interesting to look at. 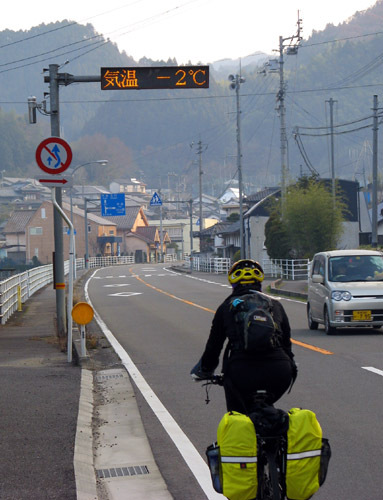 But on a trip like this, and especially because in the winter it is more difficult to pass through mountains unhindered by conditions, we elected to cycle through long stretches of urban, semi-urban, and industrial environment as well. Perhaps next time we'd better take our car to get through this and spend more time in the hills, but we did appreciate the holistic feeling of completing the whole tour (except ferries) on our own power. It was a kind of Zen exercise, pushing though the ramshackle scenery that is most of built-up Japan, all the while resisting the cold of the relatively mild but persistent winter conditions of western Japan. And the mountains and sea, as always, were peaceful and beautiful. 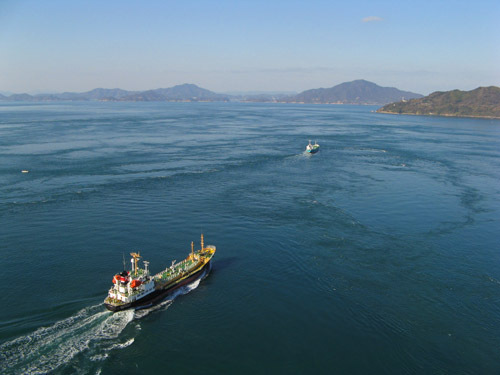 We began on the Sadamisaki Peninsula, a long narrow strip of hilly land that extends toward Kyushu, from where we arrived by a convenient ferry. 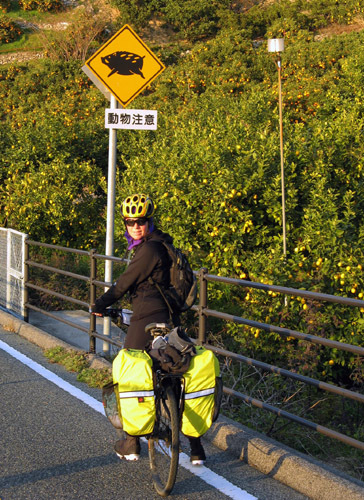 For the first time in Japan, we strapped panniers to our bikes to take the load off our backs and behinds. This way we were able to bring more gear for warmth and spent nights in our tent in reasonable comfort. The Canadian-made　Arkel panniers performed flawlessly throughout the trip. Japan's surprisingly ramshackle habitations look much better if they are situated in the countryside, like this old house amidst the ubiquitous orange groves of the peninsula. The first city we needed to traverse was Matsuyama, Shikoku's largest with a population of 510,000. We were surprised by the modern appearance and preponderance of large, brand-new-looking shopping malls of this town, as well as a huge sports and culture complex we happened upon. In an indication of where the Japanese society is heading, the malls were very crowded, whereas the culture complex was virtually deserted. We even visited a friendly MTB bike shop "Western Cycle House" which Leanne had geocoded in our GPSs before the trip. The staff greeted us with friendly chatter, freshly made rice cakes and green tea. We even appeared on their BLOG. 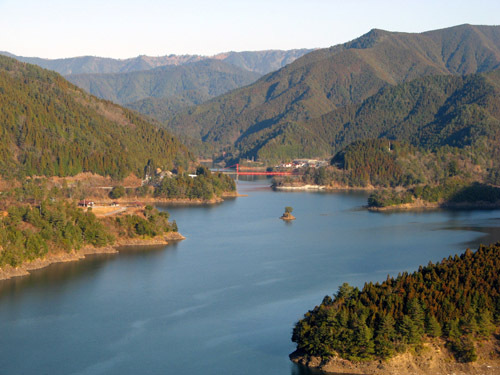 After Matsuyama we crossed a range of hills, camping off a small road circling a reservoir. That morning, like the rest of the trip, it was chilly and we balanced our effort climbing the hill to stay warm but to avoid sweating. Here and there in the rural countryside, attractive semi-traditional houses are still to be seen. In the cities most have been replaced with cheap-looking, plastic sided habitations. As we neared the top of the hill on the smooth, wide highway, we were passed by several cyclists. We met up at on the road's summit where everyone availed themselves of hot drinks from the vending machines. They were from the local track cycling club which explained their (relative) struggle climbing: their track bikes had no gears! Of course with our loads and clunky mountain bikes, we were still slower. After a nice chat, we forged on though a long tunnel underneath the mountain. 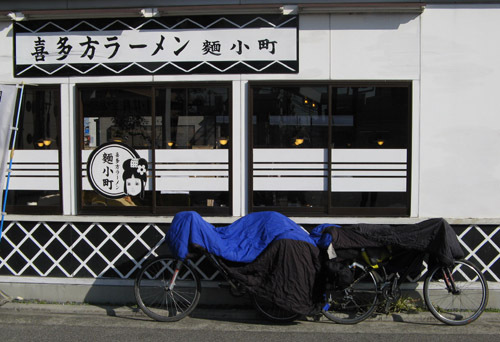 Our nourishment along the way consisted largely of ramen and udon noodles or karaage fried chicken at roadside restaurants such as this one, and assorted junk food from convenience stores. We ate prodigious quantities, for we needed energy not only for cycling but to stay warm throughout the day and night. It was perhaps not the best fuel, and somewhat expensive, but we did not have the option of carrying too much food with us as our bikes were already overloaded with warm clothes and camping gear. While stopped during the day we often tried to dry our damp gear as you can see here. Descending again to the sea, we neared our first objective: the bridges of the Shimanami Highway, one of three massive bridge systems that link Shikoku to the Japanese mainland of Honshu. 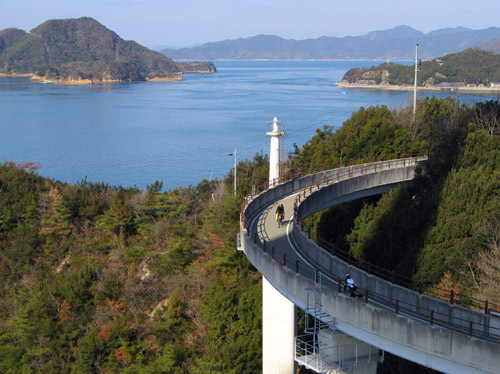 The Shimanami is the only one that is passable by bike and in fact a special bike route has been built that makes the crossings fun, exciting, and safe. 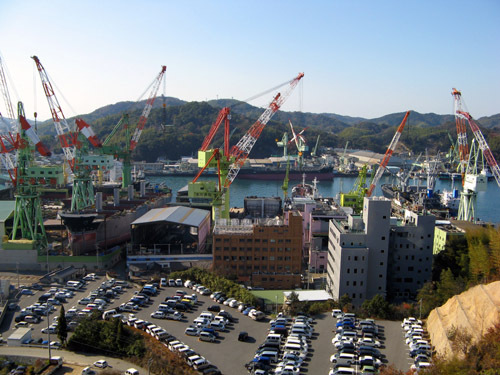 Climbing up to the bridges, one can enjoy views of Japan's Inland Sea and the industrial complexes that line much of its shores, like this ship-building yard in the city of Imabari. 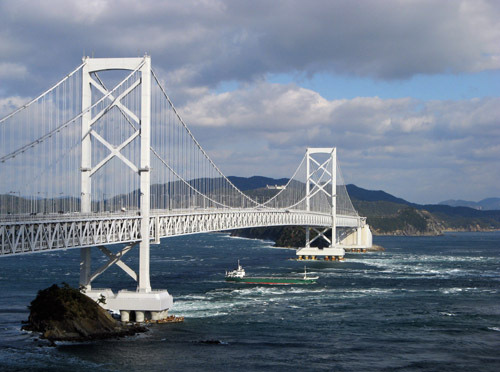 The first set of bridges span the Kurushima Strait, a busy channel that is infamous among ship captains because it's narrow, crooked, and beset with strong tidal currents. On this morning, however, conditions were good and shipping relatively sparse. Leanne descends the bicycle off-ramp on one of the bridges. We were delighted to see other cyclists, including families with small children, traversing the bridges. 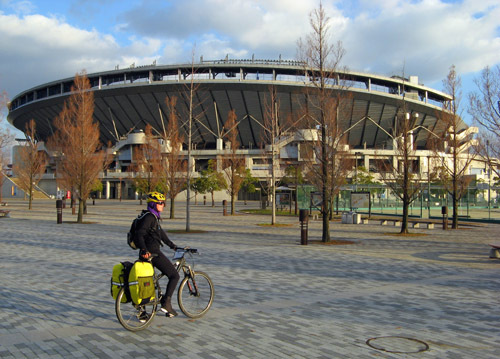 Most recreational facilities get little use in Japan, so it was nice to see an exception. 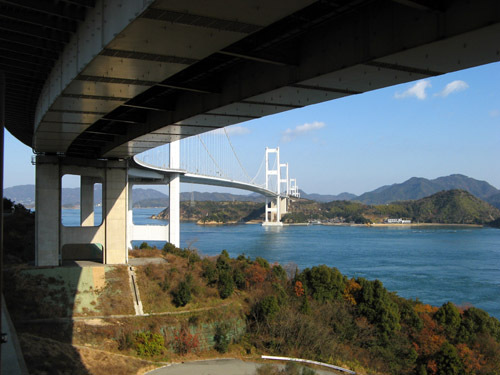 Although some of the many sizeable islands in the Inland Sea are now linked to the mainland by bridges, they still seem a little less 'modernized' than Japan's mainland. 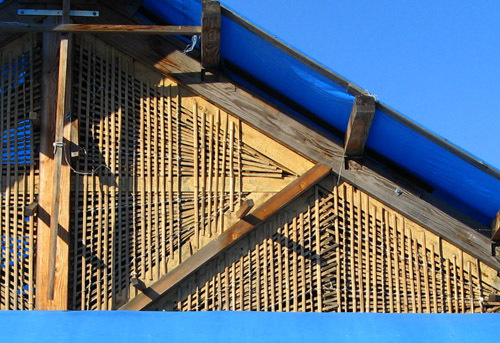 That's also evident in this modest house under construction, where a bamboo lattice will form the framework for a mud wall. In this day of drywall and plastic siding, such a traditional approach is rare indeed to see on a new house. 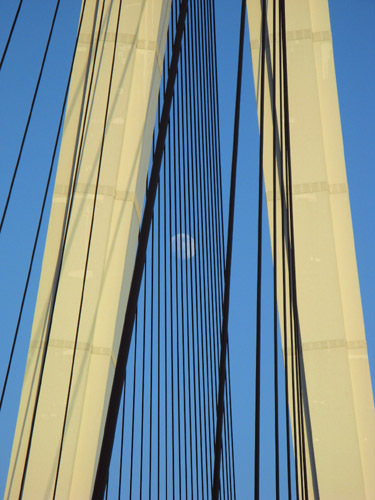 A gibbous moon rises behind the cables and pylons of a gigantic suspension bridge that spans the sea between Ehime and Hiroshima Prefectures. We had moonlight almost every night, which came in useful in the evenings as we compensated for the short daylight hours (and frigid mornings) by biking an hour or two into the evening darkness. Wild boars are common in most parts of Japan, even on some of the outlying islands where, surprisingly, they are able to swim over considerable distances in the sea. The one on this sign somehow bears a striking resemblance to Leanne! 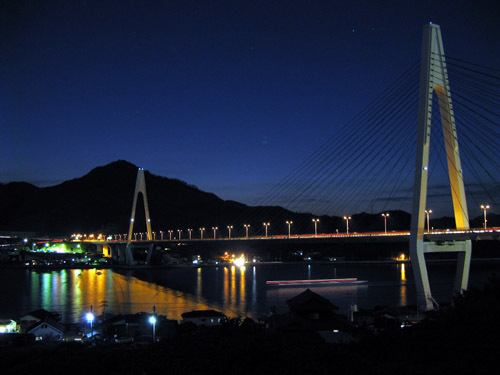 By the time we got to the final bridge of the 70km long Shimanami Kaido biking trail, it was dark but the bridge itself was nicely lit.